FAYETTEVILLE, Ark. 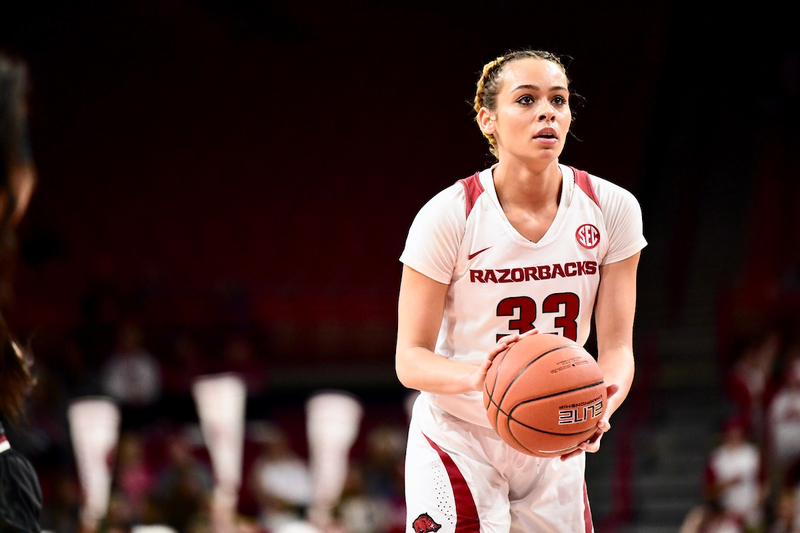 – University of Arkansas sophomore Chelsea Dungee and senior Malica Monk had career nights, but it wasn’t enough for the win over No. 16 South Carolina, as the Razorbacks fell 87-79 in Southeastern Conference action in Bud Walton Arena on Sunday afternoon. Dungee scored a career-high 32 points in 33 minutes of play while Monk tied her career-best with 25 points for the Razorbacks (16-7, 5-4 SEC). South Carolina (16-5, 8-1 SEC) survived a furious Arkansas attack with a balanced effort that saw five players score double figures for the Gamecocks. Arkansas did nearly everything right in the game. They struck first with a 9-0 run to open the game. They won the first and second quarters leading by six at the half. The Razorbacks limited turnovers with only nine miscues while forcing 11 South Carolina mistakes. Arkansas lead by as many as 12 points during the game. The difference? A 35-point fourth quarter by South Carolina that saw the Gamecocks shoot 57.1%, make three 3-point field goals, outrebound Arkansas 16-9 and get 22 points from their bench. Jailyn Mason paced Arkansas on the boards with seven rebounds It is the third time in the last four games that Mason has been the leader on the glass for the Razorbacks. •Malica Monk had 19 points in the first half. •Monk (1Q) and Dungee (2Q & 3Q) each scored in double figures in a single quarter. •Chelsea Dungee scored a career-best 32 points in 33 minutes. •Malica Monk tied her career-best with 25 points. Monk had only one turnover in 40 minutes of play. •Monk (4-4) and Dungee (10-11) were a combined 14-15 from the line and took all but four of the Arkansas foul shots. Southeastern Conference action continues Thursday as Arkansas travels to LSU for an 8 p.m. tip on the SEC Network. The Razorbacks return home hosting Auburn Feb. 10 followed by back-to-back road games at Kentucky and at Georgia as February continues.